Having partnered with Ellen DeGeneres on a “One Million Acts of Good” initiative starting last fall, Cheerios has now teamed with Walmart for the latest extension of the cereal brand’s “Good Goes Round” campaign. Cheerios and Walmart announced that, through March 2018, they will be working together to create “Moments of Good” for shoppers in Walmart stores and in communities that have Walmarts around the country. The efforts will include “several larger ‘Moments of Good’ in addition to many smaller, more localized moments,” according to the companies. 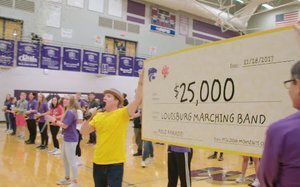 The partners kicked off the promotion by donating a check for $25,000 (above) to help a marching band from Louisburg, Kan., fund a trip to Pasadena, Calif., for the school's first appearance in the annual Rose Parade. The new promotion’s area on Walmart’s site lists 187 “Moments of Good” on a meter, but a map of such moments so far shows only the marching band donation. The site is also featuring a video of that donation event. The companies said that the “One Million Acts of Good” program launched with DeGeneres last September, being promoted on her show and through social media, inspired this latest extension with Walmart. The talk show host and cereal brand set a goal of inspiring people to perform a million acts of good by the end of the show’s current season. The DeGeneres promotion’s hub site provides various ways that consumers can share their acts of good, including using #GoodGoesRound or #OneMillionActsOfGood on Facebook, Twitter or Instagram; submitting a story, photo or video through the site; and playing a free Cheerios deck in Heads Up and uploading videos. DeGeneres is sharing some of the UGC content on her show and social media channels, and in Web videos. The General Mills brand has been running a TV ad specifically promoting participation in the DeGeneres #OneMillionActsOfGood push — amid the other TV ads rotating as part of Cheerios’ popular “Good Goes Round” campaign.